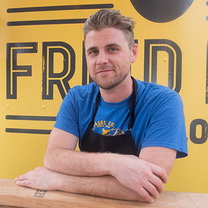 Chef and Owner of the breakfast food cart, Fried Egg I'm in Love in Portland, Oregon. "Got to try that Duck Stack last night at @canardpdx. Very very tasty." "I had a craving for the flank steak salad at @pokpokpdx today. It’s one of my favorite Thai dishes." "Incredible chefs breakfast at @#ketchupleather"
"Savory swine sandos, summer salads, and sprinkles at @#broughttoyoubytheletterS"